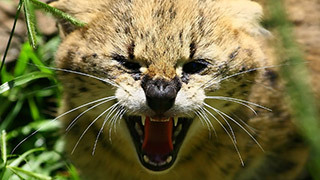 The serval is also known as the tierboskat, a family of small species of wild cats found in Sub-Saharan Africa. They have a relatively small head compared to other cats. This solitairy animal hunts at night and it's prey consists mainly of rodents, small birds, frogs, insects and reptiles. With their large ears they use their hearing to locate prey. Juveniles stay quite long with their mother and start fending for themselves at around 12 months of age.